Margaret is hosting our challenge today, and the theme is Fancy Folds. This particular challenge is for cards only. Hello sweet visitors! 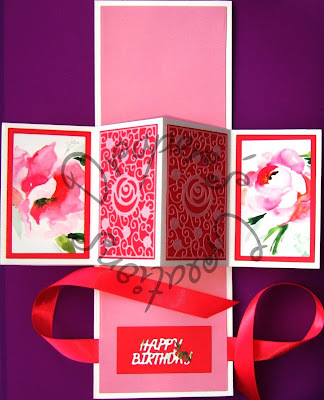 For this Challenge I have chosen to create an upright Z fold card. This is the first time I have ever made one of these and, although it does look a little complicated, it is really very simple. 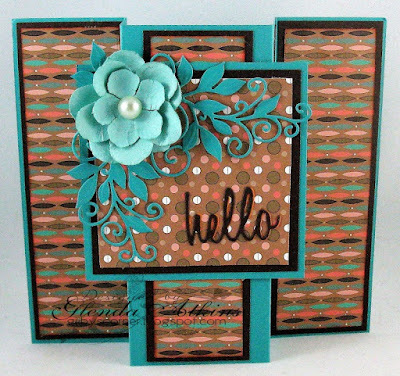 Papers are a mix from Maja and Kaisercraft (am using them a lot lately .. LOL!!) and I have added some altered flowers, die cut leaves, a piece of gauze, some prills and also a piece of lace made with a mould and acrylic gap filler .. another first for me!! I have used a gem brad to anchor the card. Cheers!! 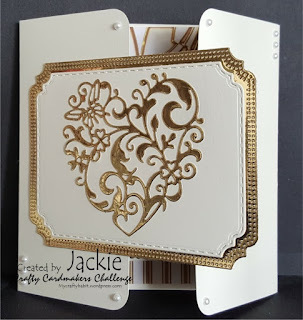 Although it's not obvious, I've used the Marianne Carousel die to make the frame of this card. To decorate, I've used images from a CDRom from My Craft Studio called Festive Deco Follies and I've taken some of the supplied backgrounds and added foreground elements. For the floor, I just printed a solid colour to match. And on the front. another background, although I had to extend the brickwork and I added a suitable greeting. 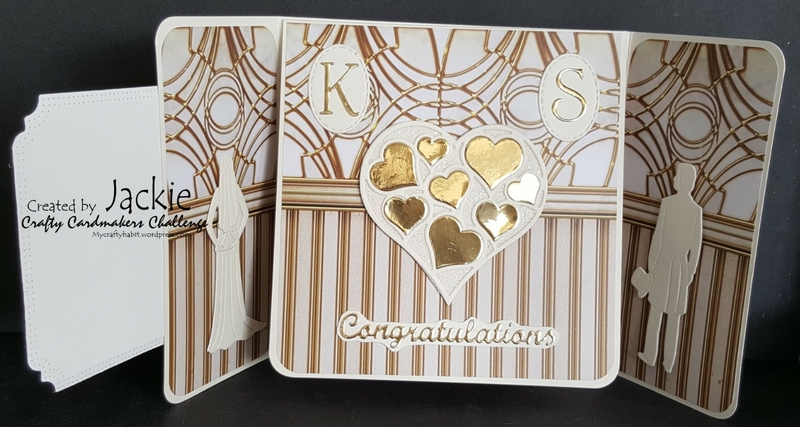 I made this wedding card for a dear friend of mine's granddaughter's wedding. I believe the card fold is called a never ending card and is actually 3 cards in one. 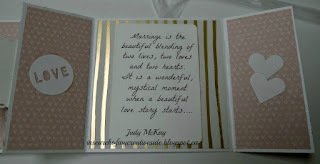 I have added 3 of my favourite wedding verses. I also made an envelope in the same paper as the card for use for a gift card or to add money. Hi all, Angela here with another Masterboard background that I've used on this card. It was made using a Tim Holtz stencil, Paper Artsy flower stamps by Kim Dellow and sentiment by Elenazinski. I finished this with Stickles glitter glue on the flowers and butterfly. Cut out an eight x six inch piece of cardstock, score vertically at 2, 3, 5 1/2 and 6 1/2 inches and fold accordingly. Cut out a 3 3/4 inch square. This is your card base, decorate as you like. So very easy. See my blog for more details. This is the front of my card once it is folded up. Below is the open card . 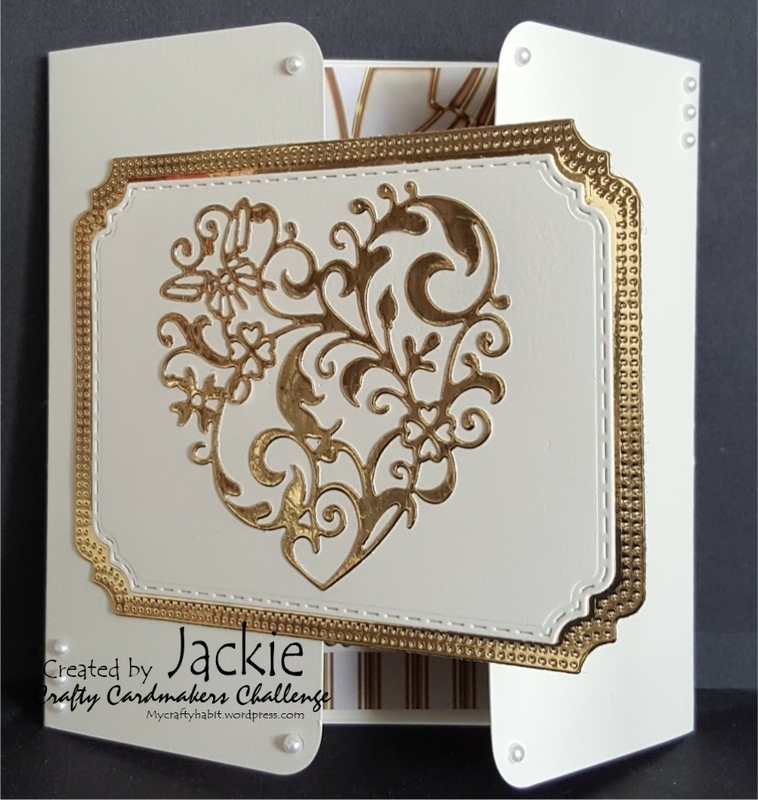 I used Tattered Lace's pop and twist card die to create the framework of the card. The images are taken from Hunkydory's Third Little Book of Flowers. 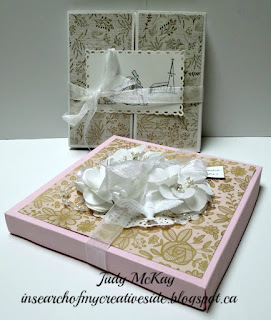 The matting papers are also from Hunkydory and I added a satin ribbon to tie closed the finished card. 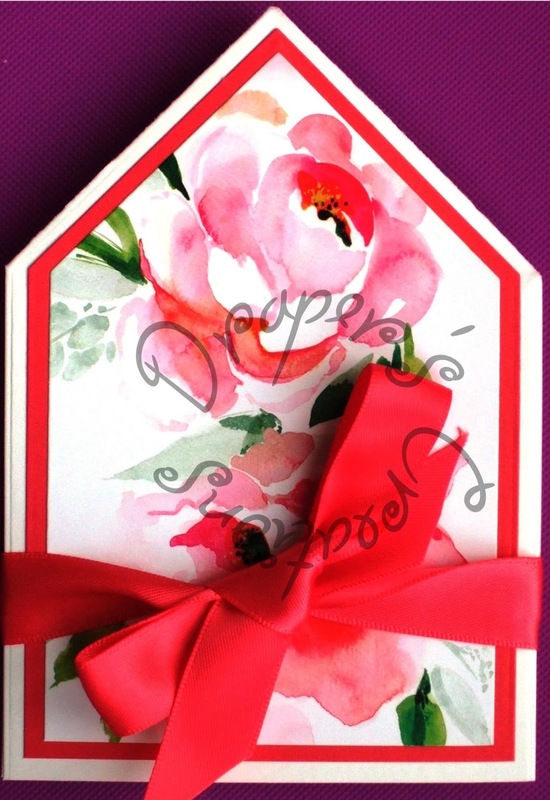 This type of card is called a flip card. Anna Griffin has dies that cut this card. The embellishments are also Anna Griffin. The center flips to reveal your sentiment. An A5 card with the front folded and cut to give the 'zig zag' fold. 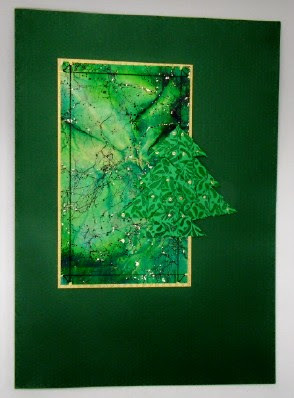 The background paper is embossed and gilding wax rubbed over it. Two clock charms added and several other die cut clock faces.... ideal for a male card! 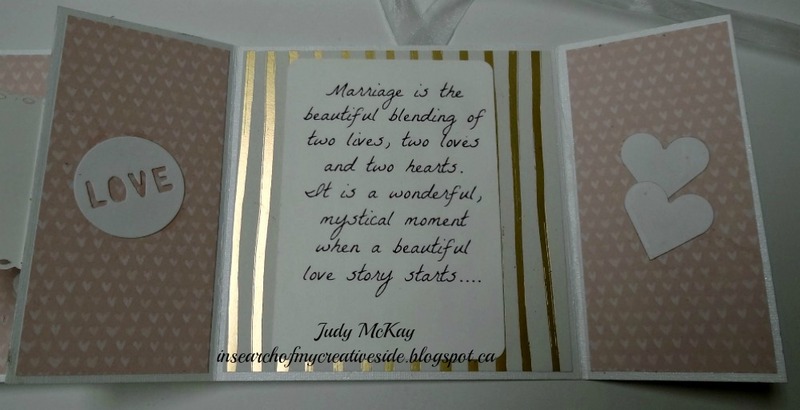 My card was made for a friends wedding, and is one of my favourite fancy folds. I used some art deco paper from my stash, plain cream and gold mirri card die cut for the embellishments. My Christmas card was actually made a number of years ago when I was lucky enough to write a book on Teabag Folding. The Christmas Tree has been created using several specially folded squares of paper. Hi, I have published both of your posts. They were there, just not published. I have left a message on your blog under one of the posts. Can you tell me if the linky gave you an error message when you tried to post and if so what was it? Thank you hellerlittle. If you get the message again, please just ignore it. I always check to see if there are any missed posts, so it will always be published. Just not maybe the same day. I will also inquire into this with Inlinkz to see if I can find out why this is happening to you. No need to apologise Donna. I can see what a hard time you have been having lately. I know the pain of putting your parent into care, so you have my complete sympathy. Thank you for popping by though. Look forward to seeing you entering in the future too.